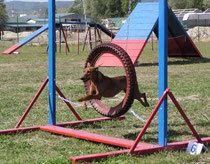 Agility - a great dog sport! First, dog agility is an excellent way to improve the relationship between the owner and the dog. Second, it is a physical fitness training for the dog, but also for the owner. Third, it is great Sanuk! At dog agility the owner has to direct his dog through an obstacle course in a race where time and accuracy are evaluated. The dog has to run off-leash and the handler is not allowed to touch the dog or obstacles. The handler's controls are limited to voice and body signals. 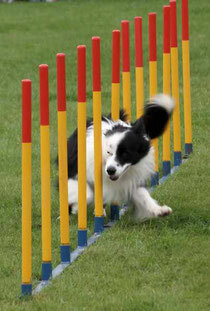 The agility course consists of different jumps and hurdles, dog-walks, tunnels and weave poles. The goal is that the dog performs the obstacles willingly and with great enthusiasm guided with no direct contact by his owner. To start training agility the dog should be at least at an age of one year. 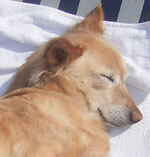 For the training it is required that the dog is always safe and has a good experience. A well to the dogs character adopted training helps timid dogs to overcome their hesitations and become more self-confident. But also for „courageous dogs“ it is an excellent way to burn-off his excess energy. +66 (0) 835 996 017.